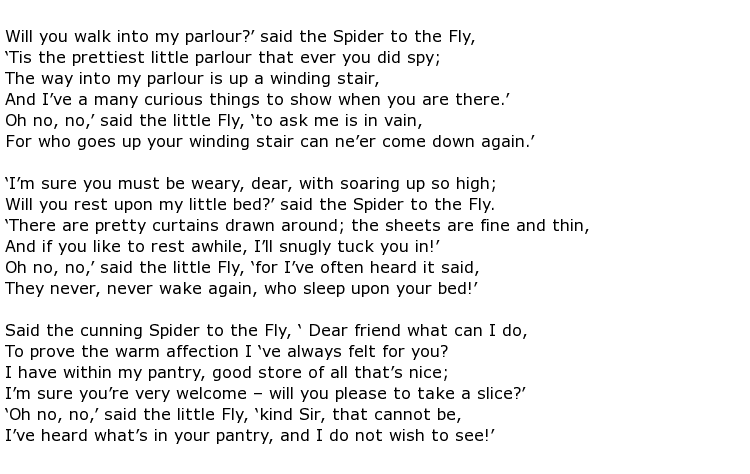 Mary Botham Howitt was a 19th century English author who is best remembered for her famous children’s poem The Spider and the Fly. Her literary output was considerable and, collaborating on many projects with her husband, she had over 180 books to her name. She was born Mary Botham on the 12th March 1799 at Coleford which is a small town in the Forest of Dean area of Gloucestershire. This was a coal mining area at the time and Mary’s father was custodian of some mining property. The Queen Anne style house where she grew up in the town still stands and is called Howitt Place in her memory. She was home tutored and soon developed a love of books, reading as many as she could. They encouraged her to start writing poetry from a very young age. She was fortunate to meet and marry William Howitt, a man with a similar outlook to hers on literature. Mary was 21 when they married and they set up home in Derbyshire where her husband had a pharmacy business. He soon gave this up though to join his wife in her writing endeavours. Their first joint venture was a collection of poems based on the area they lived, called The Desolation of Eyam and other Poems, published in 1827. They had already seen a number of pieces published in a variety of periodicals and newspapers. The Howitts enjoyed the company of other writers such as Elizabeth Barrett Browning and Charles Dickens and their reputation grew rapidly. Mary started writing poems and short stories for children shortly after they took up residence in the Surrey town of Esher in 1837. Her work was very popular, with even the reigning monarch, Queen Victoria, enjoying her work. Having moved to London in 1843 the Howitts found they had the distinguished Alfred, Lord Tennyson as a close neighbour. Besides her large output of fictional work Howitt also wrote factual books such as The Literature and Romance of Northern Europe, published in 1852, and two volumes of a Popular History of the United States in 1859. Her renown as a writer won her many awards including a civil list pension of £100 per year from April 1879. Having converted to Catholicism late in life she was selected as one of a delegation chosen to meet the Pope on the 10th January 1888. Unfortunately within three weeks of this great occasion she was dead. 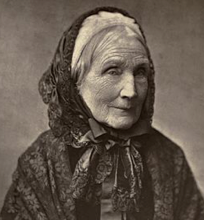 Mary Botham Howitt contracted bronchitis and died in Rome on the 30th January 1888 at the age of 88. She was remembered as a spreader of “good and innocent literature”, a description that appeared in her Times Obituary.